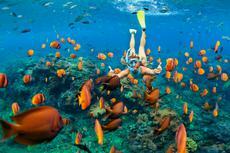 What makes snorkeling incomparable experience is the destination. The leisure hobby is not all about warm water, popular beaches and tropical fish. Some of the best places to look at the sea life below you are in icy cold seas and rivers, between two continents, or in isolated ridges. Sometimes your companions can be much bigger than you – like humpback whales or dolphins. Snorkeling is, in some ways, better than scuba diving. You don’t need heavy equipment, it’s easy for kids so you can engage them in a fun activity, it’s much cheaper, and it’s a lot less technical – you just need to know how to swim. Some of the places on the list are extremely remote reachable only by boat, while others are just a few minutes from the shore, making for a pleasant swim in gentle currents and pristine water. Some are surprising. You probably never thought of Iceland or Brazil as good snorkeling destinations. Few water activities will bring you closer to sea creatures in their natural habitat than snorkeling. It is the perfect way to get close to pure marine life without swimming at unnerving depths. The most famous spot is Australia’s Great Barrier Reef. But several others are equally enchanting.